While Outlook 2007 offers many new features that do indeed offer real benefits it can come at a price – performance. It can appear sluggish and unresponsive. So what can be done about it? Well here are some tips you can do to improve its performance. A little-known feature in Outlook is the ability to keep an email but delete one or several attachment. Firstly, sort your inbox by file size (descending) and open a message (by double clicking so it opens in a new window) where you no longer wish to keep the attachment. Right click over the attachment and select Remove. Now save the email, repeat with all relevant emails in this mailbox and then repeat in any other mailboxes (including your sent items). Maybe you disabled the autoarchive facility when you first saw it because you didn’t understand it? Archiving old emails into a separate file still allows you to access less frequently used material when required but keeps your system running faster as it does not have to trawl through all of this redundant content regularly. Click File -> New -> Outlook Data File. Enter a name for the file – a new folder will now appear in the folder list on the left. You can add sub-folders to this by right clicking, which is useful if you want to create a similar hierarchy to your current inbox. Once done simply select multiple files in your main inbox and drag/drop them to the same inbox in your new archive folder. Repeat for all other folders (e.g. Sent Items and any others that you may have created). Close the new data file by right clicking over the title and selecting Close [Folder Name]. Now when Outlook loads it only loads you nice lightweight folder! Outlook 2007 is known to be far less tolerant of large PST data files than Outlook 2003. Aim to keep your main PST file under 500MB – the smaller the better. Click on Tools, Trust Center and Add-Ins. Now select one of the various options from the dropdown menu at the bottom and uncheck any add-ins that you don’t use. Restart Outlook and see if this makes a difference. Tip 4: No need for fax? Ditch it! If you do not send or receive faxes on your PC then uninstall the facility as this has been known to cause issues with Outlook 2007.From Control Panel select Add/Remove Programs, select Add/remove windows components and uncheck Fax Service. Outlook has an error logging capability, which could be useful if something is going wrong. Click Tools, Options, Other, Advanced Options and then tick Enable Logging. Logs will be stored in C:\Documents and Settings\[Username]\Local Settings\Temp\Outlook Logging\. Look for any errors, especially in OPMLog.log – perhaps relating to the checking of email on one or more of your POP3 accounts. Use Outlook’s compact facility to compress your folders, especially your main PST file. Click on top folder name (e.g. Personal Folders), right-click and select Properties. Now select Advanced and then click on Compact Now. If you are connecting to an Exchange server then the synchronisation (cacheing) process will add a further overhead to your system. You can switch off cacheing so that your PC always looks to the server for its mail, however be warned – this can cause a number of issues, such as massively increased network traffic, problems with junk mail filtering and the inability to read mail when you are not connected to the server. Check the Microsoft knowledge base for Exchange optimisation techniques here, as this is a constantly evolving issue and there may be more solutions by the time you read this. If you are using IE7 and RSS feeds Outlook will also store all feed threads by default. Click Tools, Options, other, Advanced Options and then uncheck Sync RSS feeds to common feed list, followed by Any RSS feed that is updated appears as a new item. Close these screens and then click Tools, Accounts, RSS Feeds and delete the feeds. Now you have to delete the RSS threads from the RSS threads folder in your mail folders. Outlook has its own self-repair mechanism. Click on Help and Office Diagnostics, and then let Outlook run its diagnostic tests, which can take 15 minutes or so. Under Tools, Rules & Alerts, Options select Upgrade Rules (only if you don’t use these PST files with an older version of Outlook). This updates the rules to Outlook 2007. 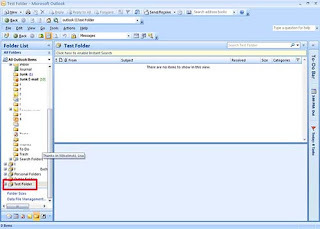 Quit out of Outlook 2007 and locate each of these files in turn and rename as indicated. Note that there are known issues with Outlook taking a long time when checking POP3 accounts. According to several blogs it relates to the AUTH command and only affects certain mailservers. It is wise to check that your settings are correct – options such as setting authentication as on may not actually be necessary and could be the cause of many of your problems, so check your ISP’s website for EXACT settings. Yesterday in my MS Outlook was big error and after all mails were deleted.But fortunately google helped me and I found-how to read ost file.Tool recover all my data very quickly.It is free as is known.Moreover tool helped me to read ost files without Outlook and save all your emails, contacts, tasks and calendars, that may be lost.